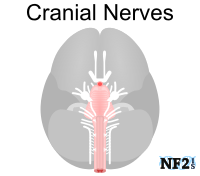 The central nervous system (CNS), includes cranial nerves (CN) and the spinal cord. Nerves of the CNS are the core nerves of the body. 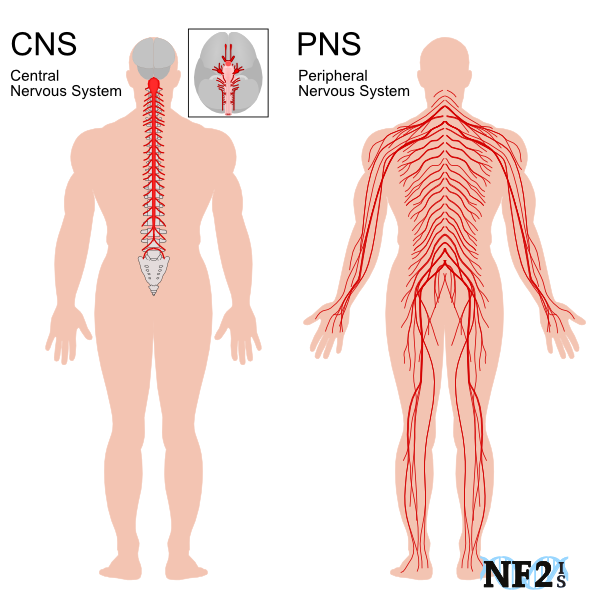 Nerves outside of the CNS are nerves of the peripheral nerve system (PNS). 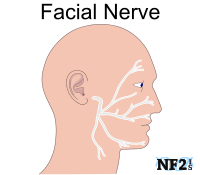 The PNS are nerves in the; face, arms, legs, torso, but also include some nerves in the skull. 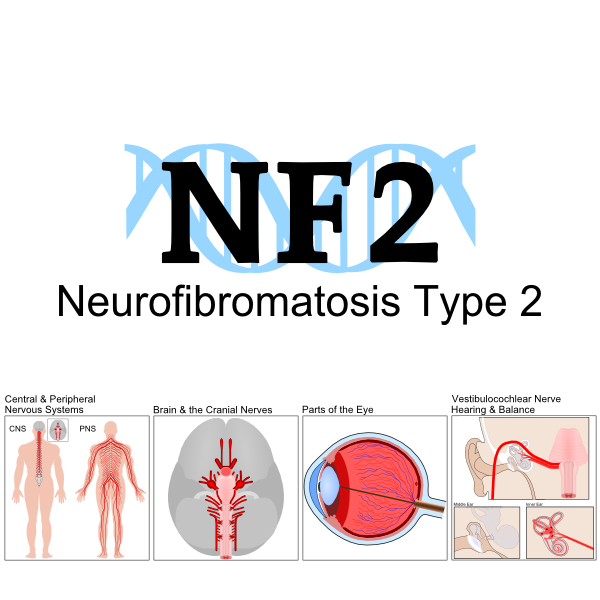 Neurofibromatosis type 2 (NF2) is best known for damage to the CNS from tumor growth, however; 1) damage to the CNS can also damage the PNS and 2) there is no isolated region of the body tumors will grow in individuals with the NF2 condition. Neuropathy is nerve damage. Individuals with NF2 can develop different forms of neuropathy for different reasons. 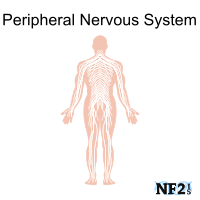 There are two major forms of Neuropathy an individual with NF2 might face; 1) Peripheral Neuropathy, and 2) Radiculopathy. Both are issues of the PNS. Radiculopathy is the term for neuropathy that affects only some part of the peripheral nervous system, resulting in the issue of the use of a part of the body on one side, example; a leg, a hand or one side of the face. Peripheral Nerve damage has a better chance of healing more completely than Cranial Nerve damage, even if healing might take over several months of showing signs of recovery. NF2 Peripheral Neuropathy is Peripheral Neuropathy - Polyneuropathy (PNP), an issue which is said to develop at some point in 66% - 70% of individuals, but as all other statistics for NF2, is debatable and could be found in a higher or lower percentage of people. 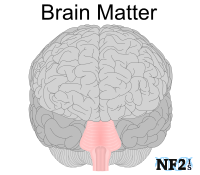 As a result of PNP, many who have NF2 are either instead diagnosed as having multiple sclerosis (MS) instead of NF2. 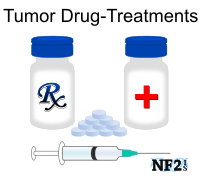 Misdiagnosis of NF2 PN is less likely now as neurologists are more likely to order MRIs, as a CT Scan is less likely to show there may be brain tumors for a full complete diagnosis of NF2. If your body is always cold or doctors have a hard time finding veins for IV injections you may have a circulation problem. 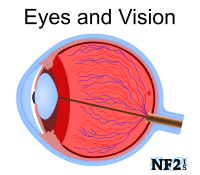 Circulation issues are not uncommon among people with NF2, it is one of the signs of Peripheral Nerve Damage. The following things can make circulation worse; 1) caffeine, 2) alcohol, 3) smoking cigarettes, 4) poor diet, 5) overweight, and 6) lack of exercise. Amyotrophy, Muscle Wasting and also known as Cachexia is a wasting syndrome. Muscle Wasting is Autonomic Nervous System (Organ) Dysfunction; loss of body mass that cannot be reversed nutritionally. 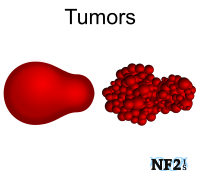 While this can be found in people with different health conditions, for NF2 it arises from tumor damage to the nerves in the body that stimulates the muscle which results in loss of weight, muscle atrophy, fatigue, weakness, and significant loss of appetite. Other reasons for muscle atrophy is vertebrae damage following a slipped (herniated) disk from either tumor growth along the spinal cord or spinal cord abnormalities; scoliosis, kyphosis, or kyphoscoliosis). Unrelated to NF2 muscle atrophy is also possible as a result of; 1) multiple sclerosis (MS), 2) type 2 diabetes, and 3) axillary nerve dysfunction (AND). How many people were diagnosed with MS or Type 2 Diabetes instead of or as well as NF2, as a result of Muscle Atrophy from NF2? Answer: Unknown, but more than a few. 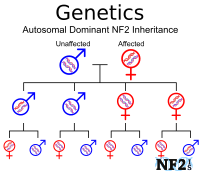 If an individual with NF2 has a family with MS or Type 2 Diabetes a review of their health by a neurologist familiar with NF2 is warranted and is in part the reason genetic testing for an entire family. Since it is hard to find the Schwannoma on the nerves with an MRI, an Electrophysiology Nerve Test (EMG) can be done to see nerve weakness and done again as needed to monitor change in nerve compression over time. Fasciculation - Muscle twitching or cramping, involuntary muscle contraction and relaxation g.
Muscle Wasting (Muscle Atrophy) - Weakness, loss of muscle bulk and loss of dexterity. Sometimes, cramps are a sign of motor nerve involvement. Paralysis - Difficulty or inability to move a part of the body. Circulation Issues - Inability to regulate body temperature. Early Satiety - Feeling full after eating a small amount. Eating organic foods, minimizing added nerve damage from pesticides. Drink more Water: Water in foods and drinks can count towards daily requirement of water if food or drinks do not contain Caffeine or Alcohol. Hand or Foot Massage: Never have a Back Massage if you have Spine Tumors. Hot Bath or Shower: As hot water washes over skin it draws blood to the surface, stimulating circulation. Ankle Foot Orthosis (AFO Braces): Afailible in different shapes, plastic, and various metals. purchased easily off the shelf or with better fiitting braces from doctors office. can conflict with body implants if used to close. if a dividuals have a heart or hearing implant, they should talk to their doctor. Topical options: Biofreeze and Neuragen PN. Medication: neurontin (gabapentin), cymbalta (duloxetine hydrocholride), lyrica (pregabalin), or antidepressants. Radiculopathy is damage to peripheral nerves from the spine all the way to the nerves end, as a result of tumors within the spine causing compression damaging the complete nerve. This could be Schwannoma on nerves, or either Meningioma or Ependymoma compressing on nerves in the Spinal Cord, at the nerves root, can damage the nerve all the way to the nerve ending. Pain or weakness would be based on exact location of the tumor.